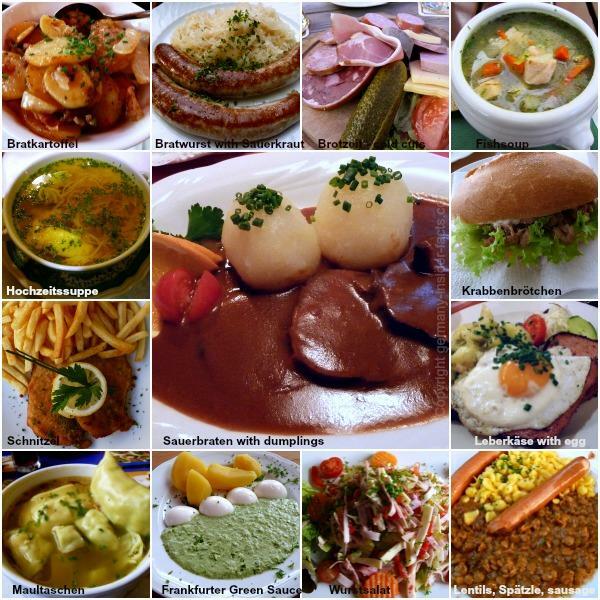 German foods are as varied as the landscapes and the people. No, we don't live all on sauerkraut and sausages :). Let me introduce you to Spätzle and Sauerbraten, Black Forest cake and German Christmas cookies. Join me on a journey to the culinary delights of German cooking. Favourite dishes - Do you get hungry? Traditional German cuisine is rich, some say heavy, but it is tasty and delicious. After all, fat in food is the medium to carry flavour. But we also adapted customs from our European neighbours & immigrants and we love fresh vegetables. So, apart from traditional rich fares you will find a wide variety of light and international dishes in modern German cooking. German cuisine also differs widely during the year. Mushrooms, game, vegetables, they all have their season. It is the secret of many German dishes that they are cooked with local and fresh ingredients. Why are there so many traditional recipes in Germany? You'll find the answer in our history. For hundreds of years the German Empire consisted of a large number of smaller sub-units, kingdoms, free cities, duchies etc. People of these small territories were (and still are) proud of their culture, customs and, of course food specialties. As a result Germany still has such a wide range of traditional foods and customs which often don't relate to an entire state but to a certain region. Germany is famous for its variety of bread and sausages. Actually, that's what I miss a lot when I am abroad, especially the bread. Although we have many favourite meat dishes, sausages are very often the alternative for meat in daily meals. This is just a quick overview of some well-loved regional dishes. As the German foods section grows, you'll get a complete guide to the German cuisine. Weisswurst is a typical Bavarian specialty. It is available from butcher shops everywhere in Germany these days, but you will hardly find a restaurant outside Bavaria that serves Weisswurst. Although Currywurst was invented in Berlin, it is now a favourite fast food throughout Germany. Spätzle, Maultaschen and Black Forest Cake are the top hits in Baden-Württemberg. 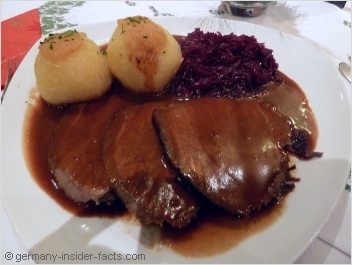 Rheinischer Sauerbraten (North Rhine-Westphalia and Rhineland-Palatinate), Thuringian Bratwurst and Handkäs mit Musik (Hessen) are well-known in Germany's central states. In the northern states seafood abounds, but there are also famous meat dishes like Königsberger Klopse and Grünkohl mit Pinkel. Labskaus consists of corned beef, potatoes, beetroot and herring. Soups play an important role on the German menu. Light soups as a starter, or hearty soups and stews as the main dish, we love ours soups. Light salads like lettuce, tomatoes and cucumbers often accompany a meat dish. But we also have filling salads such as noodle salad and potato salad. The latter is a favourite site dish with all kind of sausages. "Eat breakfast like an emperor, lunch like a king, and dinner like a beggar". It would be healthy to follow this advice, but it is hardly managable in real life. People who go to work have only a light breakfast. Cereals, a slice of bread with jam, cheese or cold cuts. I can't eat much when I am in a hurry in the morning either. Schools have a breakfast break at around 10 am, and people at work often have the chance for a quick snack around this time. It is a different picture on weekends and holidays. A full breakfast at hotels, and at home, includes bread rolls, toast, sausages and cold cuts, cheese, boiled and fried eggs, muesli and cereals. Going out for brunch on a Sunday has become very popular recently. Germans love to have their main meal of the day at lunchtime! At least this was the common custom when women didn't go to work. When I grew up in the 1950s and 60s Mittagessen was ready when the kids returned from school. Men had their warm lunch at the canteen or cafeteria at work. This has changed of course, as more women go to work these days. 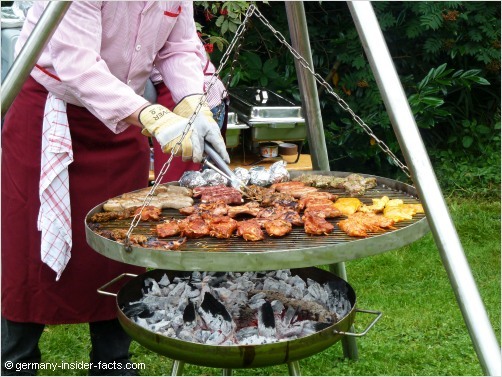 However, on weekends, Germans usually have their fully cooked meal at midday between noon and 2 pm. A traditional German Mittagessen consists of a light soup, meat, vegetables and potatoes or rice as main course, and a delicious dessert. At many restaurants you'll find the "Stammessen" or "Tagesgericht" on the menu at lunch time. This is a 3 course meal at a special price that changes daily. "Kaffee" is similar to the British tea time. A break some time between lunch and dinner, to enjoy a cup of coffee and a piece of cake, or cookies. In these busy times, we won't have a "Kaffee break" during the week, especially not while at work. However, on Sundays and public holidays, having "Kaffee" is still an important tradition. For birthdays and other celebrations you are often invited "zum Kaffee". Hey, you won't get only one piece of cake at a Geburtstagskaffee (birthday coffee invitation)! So be hungry when you arrive! When I was a child it was kind of a rule that the host had to serve one cake per person. It is still a little bit like that in rural areas. Really, you will have an incredible choice of yummy cakes when you are invited to a special event Kaffee. The traditional German dinner consists of rye bread or toast, cold cuts, cheese, salads, pickled vegetables, canned fish, or even leftovers from lunch. However, these days many Germans have their warm meal for dinner, especially when they don't have the chance to get a cooked meal at work. A cooked dinner during the week hardly consists of 3 courses. Thankfully, the food industry provides working housewifes with lots of frozen food, ready-made sauces and soups and other handy stuff to prepare a quick and delicious meal. In restaurants you find a wide range of cold specialties like Wurstsalat, Restaurationsbrot, cheese varieties, sausages etc. There is often a separate menu called Vesperkarte, or Brotzeitkarte. Items on these menues are also available during the day. Germans love to barbecue! As soon as temperatures are climbing towards the 20°C mark, the smell of grilled meat and sausages is in the air at dinner time. There is nothing better than a spicy char-grilled sausage and German potato salad, yum. Having said that, not all Germans like the smell of a barbecue. So it can become a controversial issue, especially in apartment buildings with many residents. In some houses it is prohibited to grill on the balcony with an open fire. Brot - bread, did you know there are more than 300 kinds of bread available in Germany? Now did I make your mouth water? Don't miss my favourite German food recipes!